The night before, the area around Paseo del Prado and the magnificent Palacio de Cibeles, now the CentroCentro Cultural Centre, was knee-deep in debris. The mess a huge crowd leaves is extraordinary, and the place looked like a war-zone. However, overnight the armies of cleaners had moved in with seamless efficiency, and on this beautiful Sunday morning there were very few traces of the revelries of the night that had gone before. We had decided that Sunday would be our day of culture, and we’d try and fit in as much as we could. Our advice here: whenever you visit a city for the first time, buy a ticket for the open-topped tourist buses! Someone we know slightly sneered when we mentioned this, but we love it! Hop on and hop off, and you get to see all the major sights, get your bearings and then you can decide where you might like to linger. Our first stop, however, was el Museo del Prado. Despite the city being full of people, getting tickets and entry was relatively queue-less and straightforward. The Prado is huge, and really deserves at least two visits, but we did our best to rationalise our route to see the highlights, and it is spectacular if you like Renaissance art, Goya and Velazquez. But it is not just the art that is mind-blowing; the internal spaces are equally stunning in their elegance and the whole place has a scale that is so much more human than, say, the behemoth that is the Louvre (my least favourite gallery). 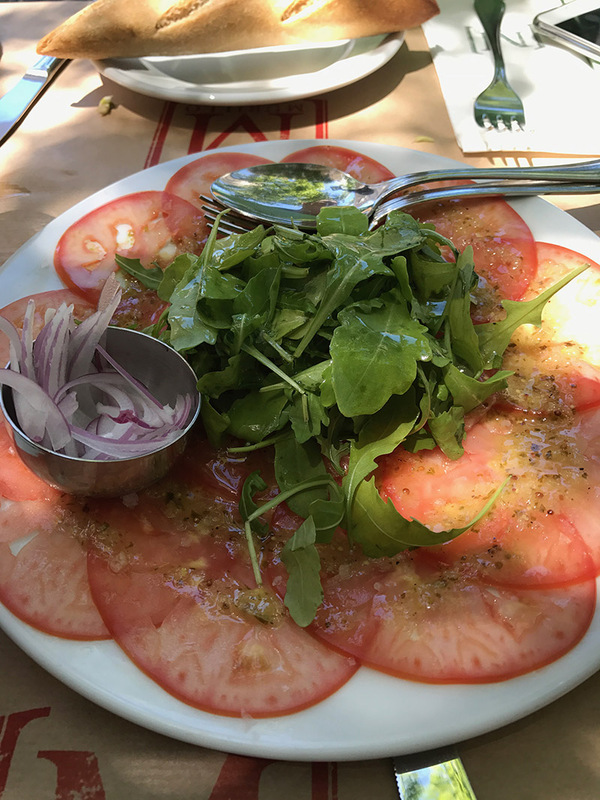 Walking out into a brilliantly bright day, we had a delicious lunch at the nearby Murillo Cafe where we had a carpaccio of tomatoes that was so full of flavour it is hard to describe. This dish was accompanied by other beautifully presented and equally tasty morsels, washed down with ice-cold Tinto de Verano. We grabbed the bus after lunch, knowing that we could partially sight-see/partially snooze from the top deck, although I think that, by this stage, Andrew felt the need to seek a bit of shade. Madrid is a beautiful city. The heart is compact and full of grand architecture, wide avenues lined with lush trees and frequently punctuated by parks. I was struck by how green Madrid actually is, and the styles of architecture were softened by the shade provided by natural canopies. We passed through the shopping and theatre districts and out towards the Palacio Real. Here, we got off the bus to glimpse the Templo de Debod, gifted by the Egyptians to the Spanish, moved here and rebuilt. Further along lies the magnificent Palacio Real, a majestic palace in the grand Baroque style, reminiscent of so much French, Austrian and Bavarian architecture, and adjacent to this grand confection lies the Catedral de la Almudena - another stunning building. This is a beautiful part of the city, from where radiate little streets that lead to gorgeous squares. Sitting in one of these squares, shaded by trees from the heat of the afternoon, we fell in love with Madrid. It was not what we had expected. For my part, I had in mind somewhere similar to Barcelona, where that sense of ‘big city’ was dominant, but Madrid is far more pretty, more elegant and at ease. Mercedes, our host, was almost a personification of the spirit of Madrid. She had the air of a person partial to the finer things in life, without pretension, but with an appreciation of all those things that make Spain such a delightful place to live - it is all about the quality of life, and Madrid exudes life from every pore. We had to leave relatively early on the Monday morning, and we were booked on a Premium Alsa coach, and Premium it was! Hugely comfortable with cabin service - drinks, snacks and anything else that you might possibly need! I am a convert to coach travel in Spain, and we are already thinking it might be the best way to get to Valencia, one of the next places on our list! 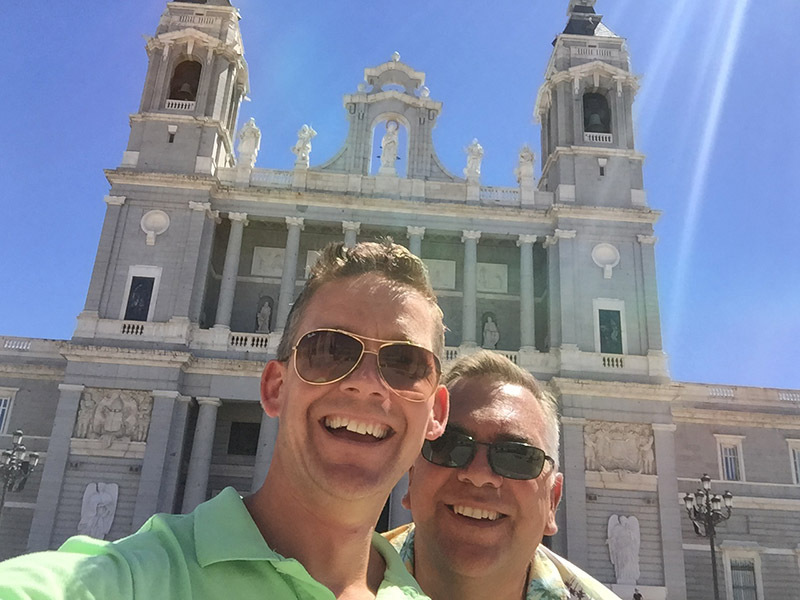 We felt we had to visit the Museo del Prado, and it was a fabulous place. Mind you, there are many other galleries that we were very tempted to visit as a priority, including the Museo Nacional Centro de Arte Reina Sofia and the Thyssen-Bornemisza Museum, so they are on the list for the next visit. Lunch was taken at the lovely Murillo Cafe, in a quiet spot right behind the the Prado Museum, shaded from the sun beneath trees and parasols. 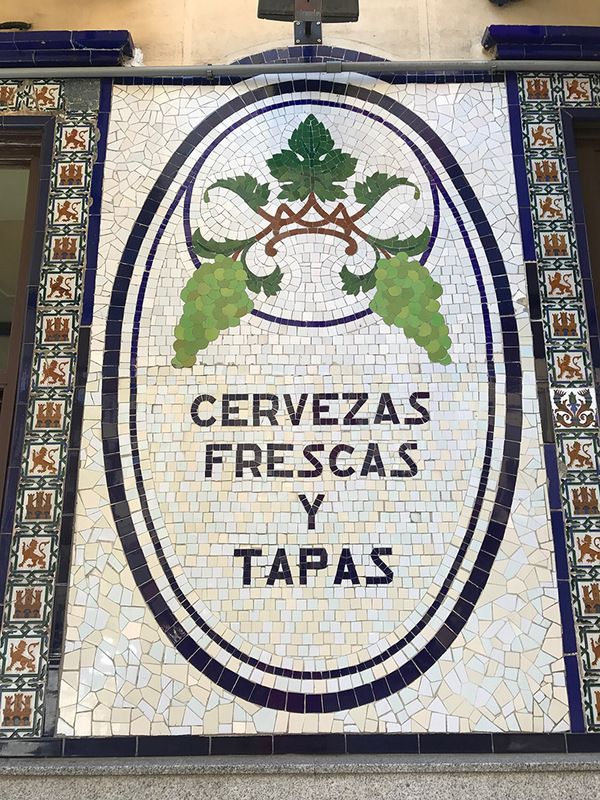 Having wondered at, and wandered around the magnificent Palacio Real and the Cathedral, we found an afternoon watering hole in the pretty Plaza de la Paja - preferable to the rather overwhelming and slightly tourist-looking Plaza Major just down the road. 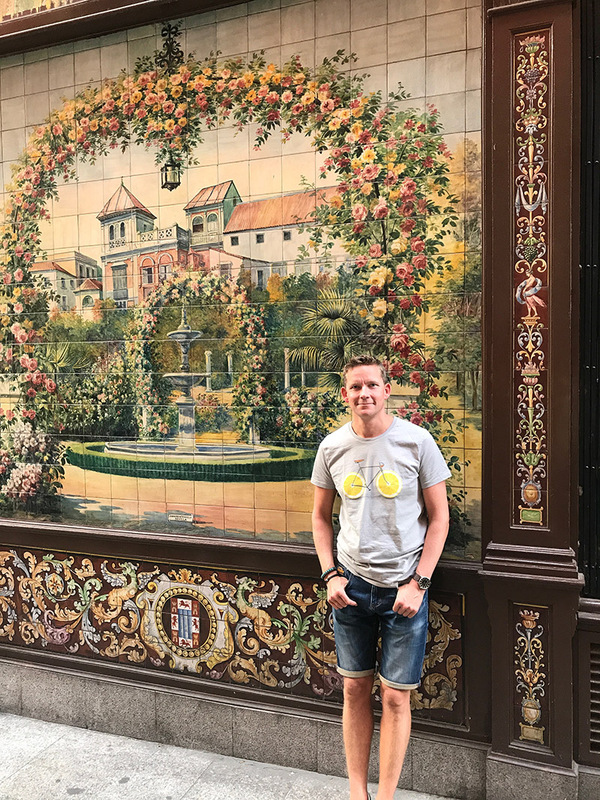 For dinner, we went to another Trip Advisor recommendation, on the edge of the Chueca district on an evening where Pride celebrations were gradually coming to an end. At Boho Bar, we were tempted by the seats that were suspended from the ceiling on ropes - love a gimmick - and the food wasn't too bad either.